Not one, but seven awesome lithograph prints in this one power pack from artists Carlos Dattoli and Dave Rapoza! 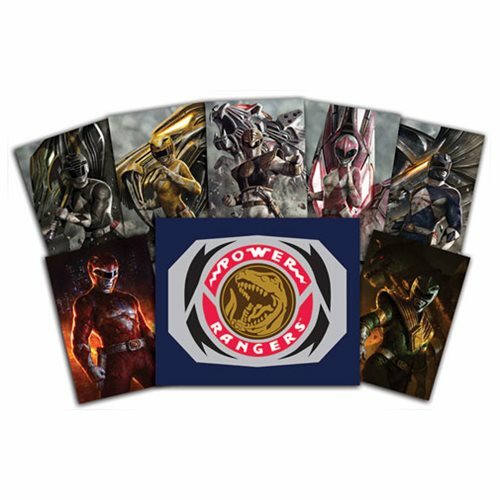 The limited edition set of just 395 pieces includes Power Rangers interpretive art featuring the Red Ranger, Green Ranger, Blue Ranger, White Ranger, Yellow Ranger, Pink Ranger, and Black Ranger. Each print in this Mighty Morphin Power Rangers Power Pack by Carlos Dattoli and Dave Rapoza Lithograph Art Prints 7-Pack measures 10-inches tall x 6 1/2-inches wide, and they all come in a 11-inch tall x 9-inch wide collector's envelope boasting a gold-embossed Zord seal!